Good morning! Happy Monday! Today I am sharing one of my absolute favorite desserts to bring to a potluck or any kind of get together. Not only is it DELICIOUS, but its perfect to make ahead of time because it just gets better the longer it sits in the fridge! I have several other poke cake recipes that I have blogged over the past (almost 4) years. Check them out below! I can not even tell you how delicious this Luscious Lemon Poke Cake is! It’s never too early for pumpkin if you make this Better than *Anything* Pumpkin Poke Cake! If you love Toffee, do yourself a favor and make this Heath Bar Poke Cake. It’s DIVINE! Let me know if you try any of these! 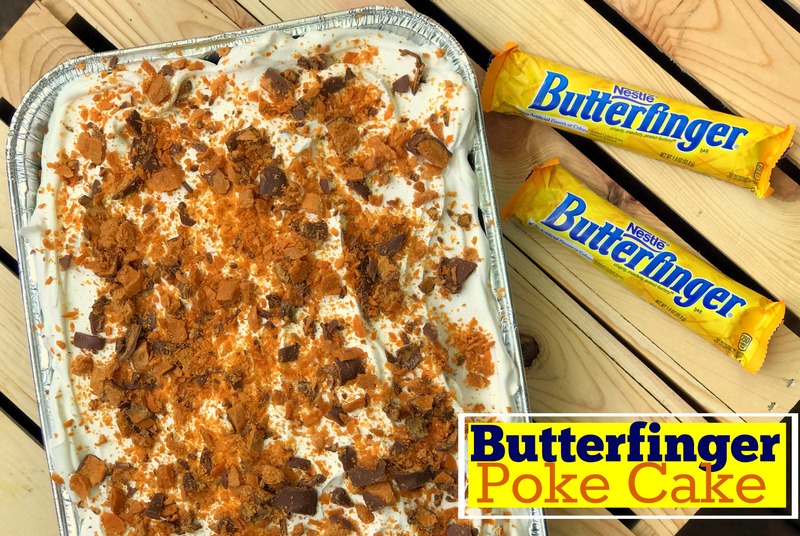 Below is the AMAZING Butterfinger Poke Cake recipe. SO GOOD! Meanwhile, mix sweetened condensed milk and caramel topping in a bowl. When the cake is done and while it's still hot, poke holes in it with the handle of a wooden spoon or a straw. Pour caramel/condensed milk mixture over the cake and allow the cake to cool completely. Sprinkle two of the crushed butterfinger bars evenly over cake. Spread Cool Whip over the top and then sprinkle the remaining 2 candy bars over the top. Chill in the fridge overnight or for several hours. ENJOY! One of my favorite cakes. Using your tips tonight for the first time!